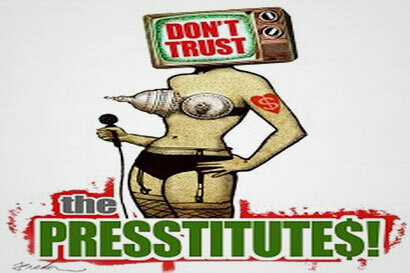 Press-titutes is a term coined by Gerald Celente combining the words Press + Prostitute and has been defined by the Urban Dictionary as “a member of the media who will alter their story and reporting based on financial interests or other ties with usually partisan individuals or groups”. An alternate definition of a presstitute is one who “screws” the general public by intentionally submitting false or misleading information to the Press”. Yet another definition has been “an individual reporter or news broadcaster, or a media news group, who reports to be unbiased, but is in fact tailoring their news to suite someone’s goal (usually corporations or big business political affiliates)”. What is implied is that such journalists or writers are neglecting their fundamental duty to report impartially. Is this the media freedom that they are demanding? We need not repeat how powerful media is – he that controls media can use it for political advantage, money and power. When we know that politicians lie, is it difficult to fathom that media lies as well? If politicians lie because of 2 factors – money and power, the same syndrome affects media as well. You are far more informed if you do the research on your own – the internet is available to see what is true and what is not. A bit of time spent is worthwhile. There is no such thing as an “independent press” – not many on a payroll would dare to go against corporate policy. People are actually paid to keep honest opinion to themselves. Very few would dare challenge the status quo because there are plenty of others to take over. Purchasing reporters is nothing new and has been happening for decades. Even the CIA has acknowledged that it has thousands of journalists on its payroll inclusive of foreign reporters too. When Governments like US, UK, EU and others of the West make allegations and accusations about human rights, freedoms, war crimes etc none of the western media cares to cover the atrocities that have been committed by these very nations following military interventions, the illegal weapons and bombs used and how infrastructure have been purposely targeted and babies born are either deformed or disabled. US media supports US interventions because the media is owned by companies who gain from defense contracts. So wherever there’s a war – they enter to make the profits. These links are never disclosed by media or reporters. Where is the unbiased reporting? It is no different in Sri Lanka how often have LTTE NOT been accused as “terrorists” by our own people preferring instead to say “Allegedly committed by LTTE”. There are many who have been paid to ensure they do not refer to LTTE as terrorists too and now other fundamentalists in Sri Lanka funded by petrodollars are busy denigrating the majority populace in Sri Lanka. If purchasing of reporters take place in countries where they boast of media freedom like the US – can we not say that it takes place in Sri Lanka and there are plenty of such presstitutes? Governments in Sri Lanka have always had only the State media at its disposal but the numbers of opposition channels and mediums far outnumber the handful available with the Government – naturally these mediums end up creating a very bleak scenario and a totally fabricated environment based on what their owners pay them to do. For its part the Government of Sri Lanka may have banned a few websites but the fact that a handful of people openly ridicule the country, openly align with terrorists and have spoken on top of foreign and local stages in support of LTTE and nothing gets done about them shows there is far more freedom for media in Sri Lanka than that what exists in the US. Just imagine if the same bandwagon of local personages that appear in unison would ever be allowed to do the same in the US and destabilize America as they attempt to do in Sri Lanka! Would US ever allow its citizens to go and talk on Al Qaeda stages, or write malicious articles one after the other against the President of the US or send emails round the world making stories about the First Family? When the head of CNN says There was ‘almost a patriotism police’ after 9/11 and when the network showed [things critical of the administration’s policies] it would get phone calls from advertisers and the administration and “big people in corporations were calling up and saying, ‘You’re being anti-American here.’ You can be sure that intelligence keeps a close tab on everything and everyone in the interest of the nation as whistleblower Daniel Ellsberg says the Government has ordered the media NOT to cover 9/11 while Sibel Edmonds says “there will be phone calls going out to the media saying “don’t even think of touching it, you will be prosecuted for violating national security” So if America can do so – why cant other countries? This is where other “journalists” may like to do some self-evaluation. There are plenty of lies of Mainstream Foreign Media and the West are the most guilty because they control the world’s media. They ensure the world listens and watches what they desire. They can make countries they target as enemies, show the world they are developing nuclear arsenal, claim that terrorists are going to attack, create false flag events – there is just about nothing they cannot do and they are enough of people who are paid and even willing to be part of the lies and bias. The examples of lies using manipulated photos, pictures and scenes and the creating of scenarios with their own crew members “acting” to show a scenario of danger. Their imagination for creating lies knows no bounds. An example of how America can lie to the people is shown in the story of titled “She was fighting to the death” by Susan Schmidt and Vernon Loeb for the Washington Post (April 2003). The story was about Jessica Lynch who was said to have been shot by Iraqi forces after an ambush and initial reports said she was stabbed to death. But Jessica in fact had no gunshot or knife wounds – so why did they lie? Then there is Amber Lyon a former Emmy Winning CNN journalist. Her revelation was shocking to say the least. “CNN is paid by the US government for reporting on some events, and not reporting on others. Obama Administration pays for CNN content” (Oct 2012). Now that is news. How come it got little publicity and none at all in Sri Lanka? Amber Lyon was ordered to report fake stories, delete unfriendly stories adverse to the Obama administration. CNN and CNN International are paid by foreign and domestic Government agencies for specific content. In March 2011, a 4 person CNN team left for Bahrain to cover the Arab Spring and interviewed dozens of people who were either tortured by Government forces, disappearance of family, activists imprisoned and videoed government forces shooting at unarmed demonstrators. Bahrain was a US-backed regime. So what happens to the documentary – CNN International never broadcasted it because the Bahrain Government had paid them not to. That’s democracy for you. Today 6 media companies control 90% of America’s media. The CIA’s Operation Mockingbird is a program that enlists journalists to work as agents and was exposed in a book “The CIA and the Cult of Intelligence” by 2 ex-CIA agents and the US Senate launched an investigation by the Church Committee – “The United States Senate Select Committee to Study Governmental Operations with Respect to Intelligence Activities” but the commission was stopped and report buried. There again is democracy for you! But the CIA admitted to having reporters on their payroll in 1982. There are said to be thousands of American and foreign journalists on CIA payroll – used for intelligence gathering, serving as go-betweens, editors and reporters shared notes with CIA some were even awarded prizes, awards as distinguished reporters and other such accolades. The foreign correspondents play a significant role given that they are given VIP treatment by host nations given them the perfect opportunity to develop ties amongst politicians, government officials, military etc which develop into “personal” relationships with the other side divulging too much information for the sake of friendship. Often locals end up becoming “foreign agents” and we can easily count those in Sri Lanka. The NGO nexus function in the same fashion as do the new Evangelical movements. So where is the credibility? How many of Sri Lanka’s English newspapers function in the interests of the country and how many editors and journalists may be on an alternate payroll is a question that needs to be answered given the coverage they give to cause disharmony in Sri Lanka. The manner the American public is brainwashed is clear by the manner the majority continue to think that Iraq has weapons of mass destruction, that the 9/11 attackers were from Afghanistan and that the whole world was against the US – they would not even believe that the jihadists were created by the US, that Osama and Saddam were on US payroll and most of the Third World secessionist movements are led by the US! The truth is out there but they prefer to listen to only CNN! Many of America’s media are members of the Council of Foreign Relations which also includes politicians, district judges, Supreme Court judges too. CFR has a 3-tier system comprising the Bilderberg Group, the Trilateral Commission and the CFR. They decide who will be leaders, politicians and what the news say or better put is only what we need to know of. Yes, politicians are simply functionaries in the objective save a few but they soon get bumped off – does Patrice Lumumba ring a bell! 10% of staff in the Trilateral Commission make up Obama’s staff. Council of Foreign Relations Brzezinski is President Obama’s top foreign policy advisor while the Rockefellers fund Obama’s political and election campaigns. CFR’s Henry Kissinger gave Obama his first job after leaving college. The gist is that multinationals and secret societies combined with media on their payroll – the truth never emerges. So when you are a member of a fraternity – what do you have to do….!!! The ugly relationship between Governments, multinationals and media is seen by the manner in which laws are created or repealed, where culprits never make the news, where the crooks are shown as martyrs and philanthropists and not much good news makes the news because the plan is to always show a country at the brink of collapse. Not surprisingly people we think as epitomes of justice are not immune either – there are enough of scandals inside the Judiciary of any nation that discounts their efforts to appear lily white. That is not to say that there are no people out there aware of the truth – there are but they are soon silenced by a tornado of others labeling them racist, extremist, fascist, hate mongers and whatever else they can come up in unison to give more credibility to their lies. The intelligent knows the game and this exposes those labeling because they are cowards to argue on facts! The truth is that the number of liars, schemers and predators are just a handful – they are the “powers” because they have found a way to control the people. The people now need to shut those controls off. If people do not entertain lies – do not listen to politicians who lie, do not buy newspapers that lie, switch of programs that lie… they will begin to get the message. People need to spread the truth amongst each other and not depend on the media that gives them the wrong picture/story. Truth shall always prevail and courage is all that is needed. No President should fear public scrutiny – for in questioning what the Govt does the people draw a better understanding and with that comes the support or opposition. All President’s have to be aware that while more than half voted for him – almost a same quantum didn’t. Therefore they cannot expect the entire country to approve everything they do. They must respect this and use medium to explain why they take the decisions they do without taking decisions irrespective of what the people think. Media and associated entities need to first understand that they are citizens of a country first. Their job is only a secondary role. You can get another job but you can’t get another country. Therefore, small as Sri Lanka is every citizen must protect it. Helping to destabilize the country for money and other gains is not a nice way of respecting the country of birth. The people of Iraq and Afghanistan had no choice, the people of Libya and Egypt did but now they regret the choice they made. The trend appears to show that a lot of media and Colombians are sacrificing their nation – and for what? Can they ever forgive themselves even if they are showered in money for forsaking the nation when it becomes no better than Iraq, Afghanistan, Libya, Sudan or Kosovo! A lot of introspection is needed at this juncture that the country is situated with. Media in particular needs to seriously review their conduct. The people of Sri Lanka are advised to spend more time researching the news for themselves and deriving their own conclusions because what the media says is certainly not what happens in reality. 2 Responses to Who are the Presstitutes? That is the main reason why independent news sources and citizens reporting on their own blogs are needed. Why? 1. Too many independent sources to be bought out. 2. Too many citizen’s blogs to be effectively suppressed or bought out. 3. This is the curse of the rulers. 4. They cannot effectively lie. There is only ONE truth, and they suppress the ONE truth with a hundred lies and still fail. Example Udayan Newspaper fire. Electricity Price Hike. Budu Bala Sena etc. etc.